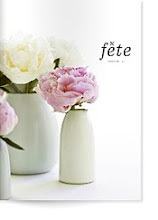 Yes, I can finally reveal the project that Annabelle and I have been working on is a new magazine we have named fête – a celebration of all things entertaining and party related. I don't know about you, but we are both seriously time-poor but still want to celebrate the good times in life in a simple, easy but beautiful way. fête will show you how easy it is to make your next event just a little bit special without all the bother. Yesterday we launched our press kit which we've sent out to prospective advertisers. We've had such a positive response already it's been really encouraging. We're just two girls with a crazy idea, it's nice to know others share our yearning for a simpler, less complicated – but no less beautiful – life. The beautiful photographs in the press kit were taken by Jessie at Follow Studio and Scott & Alia from White Wall Photography and we couldn't be happier with them – they totally sum up our whole ethos. We will be releasing six online issues a year and one speccy printed annual later next year. Our first mini 'teaser' issue will be released on the 9th of December which is just around the corner so please keep an eye out for it. I do hope you'll let us know what you think, and please like us on Facebook to hear all our news – when we find the time to post that is! Congrats to you both, I'm sure it will be amazing ! Félicitations...ce que je vois est très joli. Very exciting and desperately needed! I can't wait to see it! I have just spent the most glorious hour drooling over your debut issue! It is simply perfect - the styling, the ethos, the tone. I just adore it! And so exciting that it is South Australian! As a Crafers girl, I love the Hills references - AND seeing a stunning magazine that lists local Adelaide sources! Divine. Congratulations, ladies!